This 20 year old split entry on a corner serviced lot will continue to provide a good income for the new Owner(s) or would make a great Owner occupied home with income from the basement apartment to offset the Mortgage payments. Property currently rents as follows; Main Floor plus lower level rec-room / storage @ $850 plus utilities, One Bedroom Basement apartment @ $525 plus utilities and front section of storage building @ $50 per month. Recent renovations include new roof shingles, new air exchanger, new oil tank and 2 new hot water heaters. 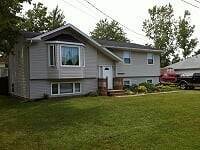 Hi, I'd like to find out more information about 9 Rayclare Cres. Thanks so much!